Miss Sews-it-all: How do you KNOW green is green? How do you KNOW green is green? Have you ever been in a color argument before? You know, when you're fabric shopping with your best friend and you're like, "I love this color red, it's my favorite!" and your BFF is like, "Umm, that's not red, that's tomato orange." Or when your husband asks, "Which of the blue ties looks best with this jacket?" 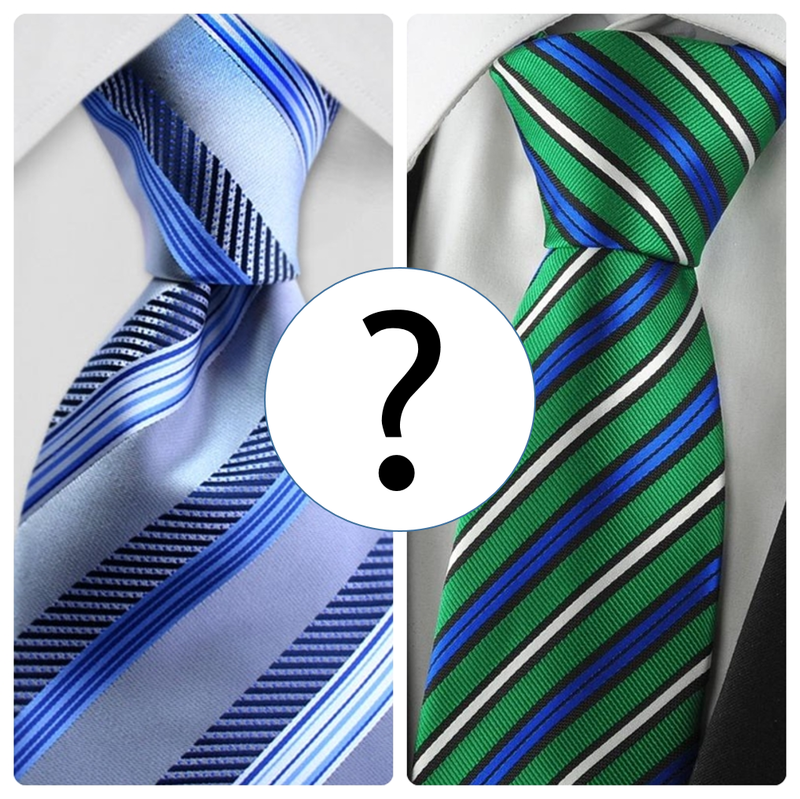 But when you look, you don't see two blue ties, you see one blue and one green! Identifying colors can be tricky, because the color of an object depends somewhat on how you look at it. It depends on what kind of light source (or multiple sources) illuminates the object you see it, and what other conditions may exist. Also, if you're not well-versed in talking about color in Color Theory terms, you may be assigning personal preference terms to colors (like calling a red-orange color "tomato" or a certain shade of green "zombie puke"). And in some cases, people may actually have a deficiency when viewing colors, as in the case of my husband Tom who has some green colorblindness, making it difficult for him to tell the difference between some dark greens and other dark colors. In fact, it was during a conversation we were having about color stuff the other night when Tom posed the question to me, "How do you know what the color green is? How do you know THAT is GREEN?" Great question, one that's worth taking a very close look at. How do you know a color is a color? 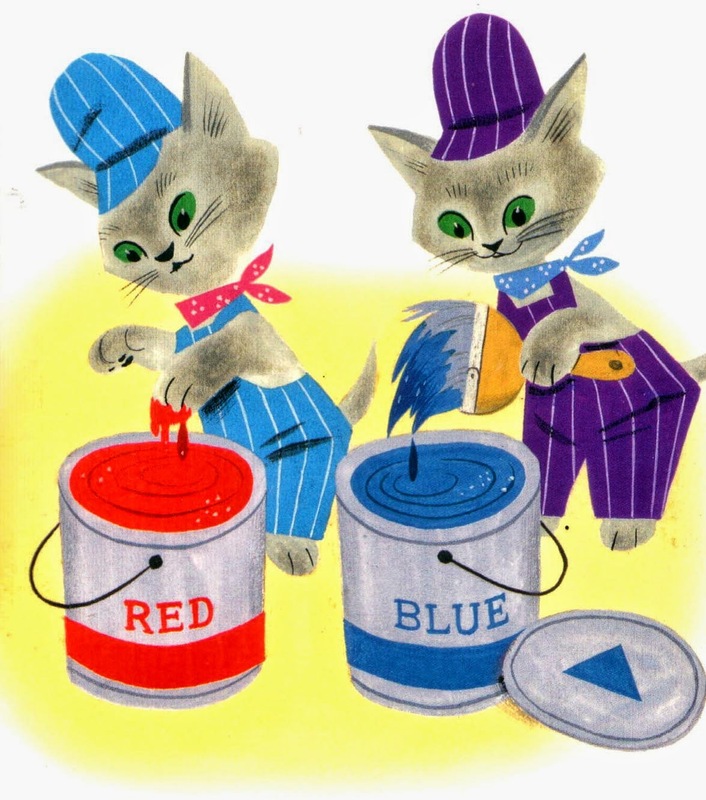 I think The Color Kittens said it best when declaring that it's easy to know the colors, because after all, "Red is red and blue is blue!" We don't all have the natural ability to identify true hues as the Color Kittens do! So for the rest of us, here's some basic information about how we know what colors are, and some tools you can use to help you become better at identifying real colors. Oh, but first, do you know the meaning of the term HUE? It can sometimes be interchangeable with the term "color" and refers to an absolute or exact color from the visual spectrum. As we learned from an earlier post about the visual spectrum, white light is the combination of all colors of the spectrum combined. 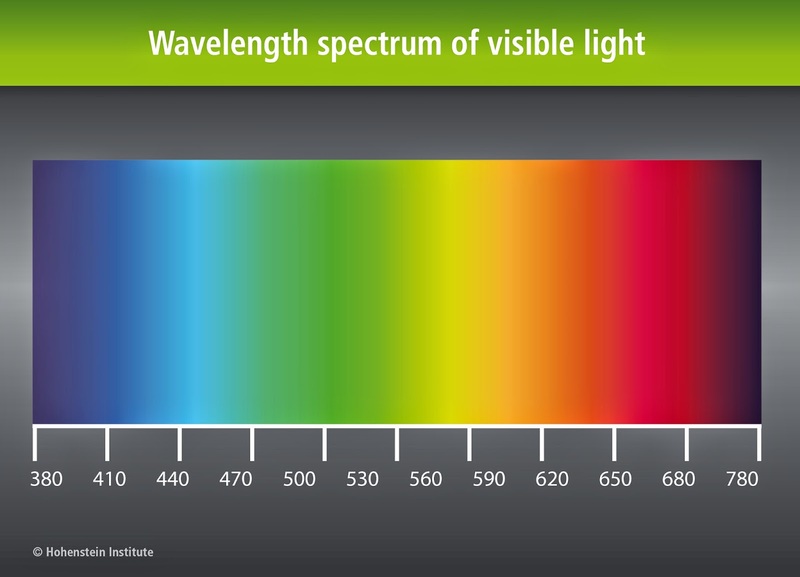 The light travels in waves, and each of the spectral colors has a different wavelength. Within that wavelength range are slight variations of that color. And by the way, our system of color as we experience it only exists within the human mind. No other animal or insect on this planet can see or experiences color exactly the way we do, and as far as we know, we are the only beings to construct such elaborate systems around colors. When you see a red car, the color only exists within your mind - your eye is perceiving long wavelengths of light reflecting off of the surface of the car, stimulating receptors in your eye that read only the longest wavelengths of light in the visual spectrum, sending a signal to your brain, where it is processed and you see the color as we know it to be RED. The red color is not inherent within the car itself, it does not exist outside our human sense of sight. Our perception of sight and color has evolved specifically over millions of years to help us navigate on this planet - we see the way we do because of our planet's atmosphere and elemental composition, our closest star's constitution and distance from our planet. If our atmosphere were comprised of different elements, or if our planet were farther away from our nearest star, our sense of sight and perception of color would be very different indeed. Back to the visual spectrum of light here on Earth! These wavelengths of light, as measured in nanometers, correspond the color names that we've given them (or that Newton has given them). Red being comprised of the longest wavelengths, violet of the shortest, and all the other colors falling out in between respectively. Below is a list of our named colors in the visual spectrum and their respective range of wavelengths. Note that Newton's ROY G. BIV model of the spectrum includes blue, indigo, and violet; this model includes cyan, blue, and violet. Newton's blue corresponds to cyan in this model, and his indigo to blue. Scientists can use Spectrophotometers to find the exact wavelength of light reflected from any object under controlled light conditions, and thus correctly identify the hue. Therefore, we can say without question what a true hue of red, orange, yellow, green, cyan, blue and violet are. We can also reproduce pretty exacting hues with special pigments or paints. Since true hues of the spectrum are identifiable, that also means we can create some structured Color Systems. 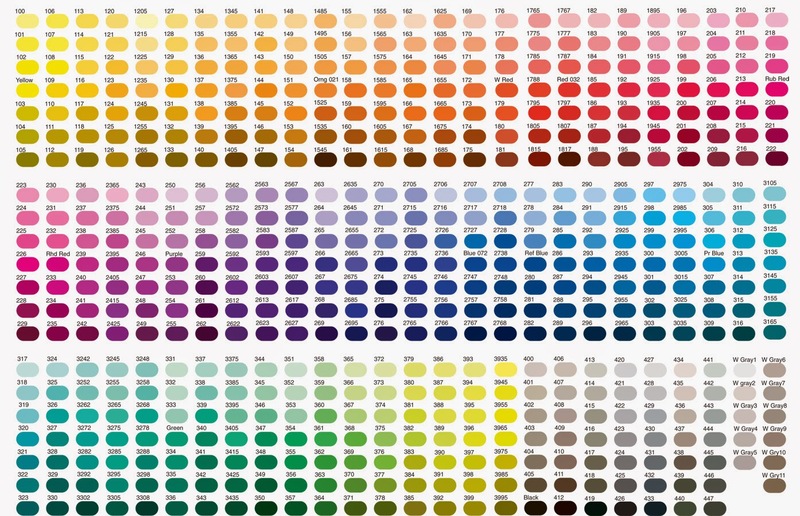 One system you might be familiar with is common to design creatives, the Pantone system. 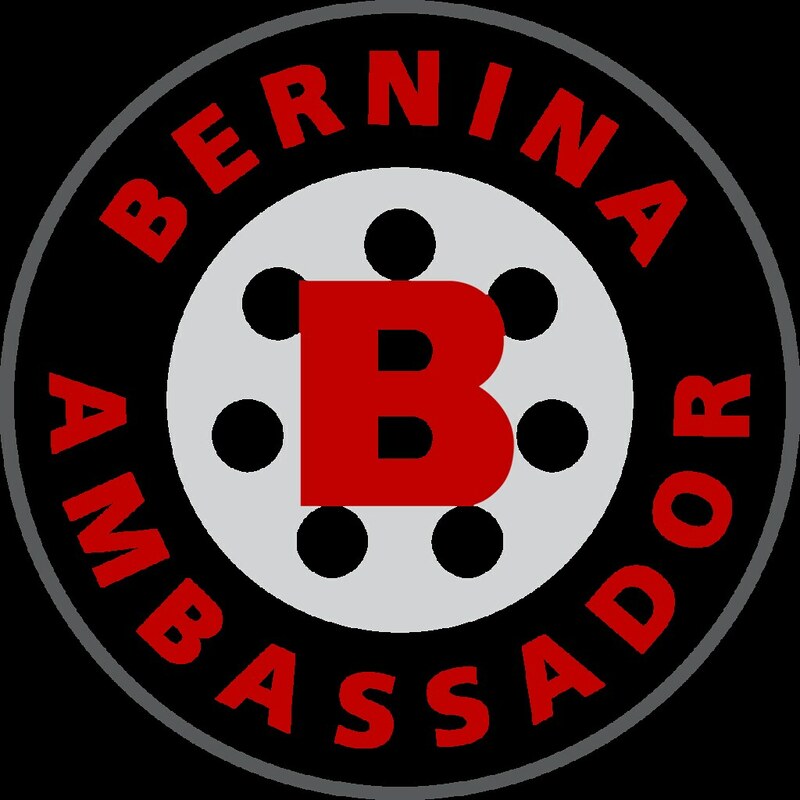 In the Pantone system when a particular color must be communicated correctly, such as a business logo displayed across several different platforms (online as well as in printed documents or product containers, boxes, business cards, etc. ), the color can be matched to one of Pantone's color chips which has a specific code attached. The printer, the webmaster, the product manufacturer can all color-match inks, printing, and website colors to the correct Pantone color with a code. You may have also heard of the Munsell Color System, another system assigning a catalog system of numbers to different colors. 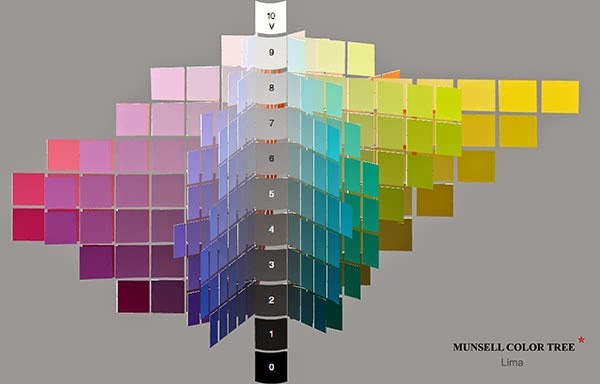 The Munsell system is what was used when I worked in an Historic Home, and we had a professional color analysis completed on layers of the original paint on the home's exterior. Munsell color numbers were assigned to each layer of paint from the analysis, and some paint stores were able to color-match modern paint with the numbers, allowing us to see the different colors the house had been painted over the last 100 years. 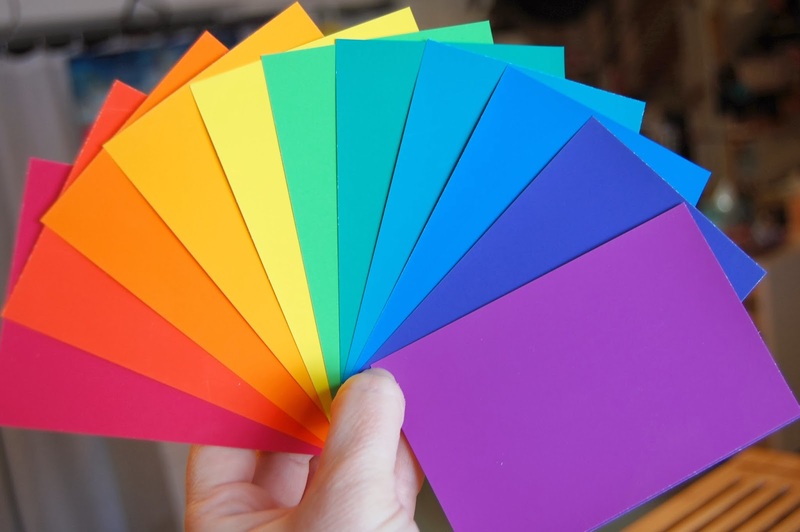 While Pantone has evolved into an incredible tool for design creatives with a full rainbow of colors, and Munsell has standardized codes for specific hues that can be matched and reproduced, neither of these systems are really helpful when learning to identify and discuss true hues as in Color Theory. To learn about true hues of the spectrum, and to facilitate further study of color, there is an excellent tool (my personal favorite) called Color Aid. Also a favorite of Color Theory pioneer and artist Joseph Albers, these specially printed colored papers are color matched to an absolute standard, are color fast (won't fade out or change if you keep them clean, dry, and away from bright light), and are all clearly identified with the hue, lightness, and saturation on the back of each color paper. Above we identified the term hue as meaning a specific color of the spectrum. In the Color Aid set, lightness refers to if it is a regular hue and is a full color, if it is a tint with some black added, or if it is a shade with some white added. 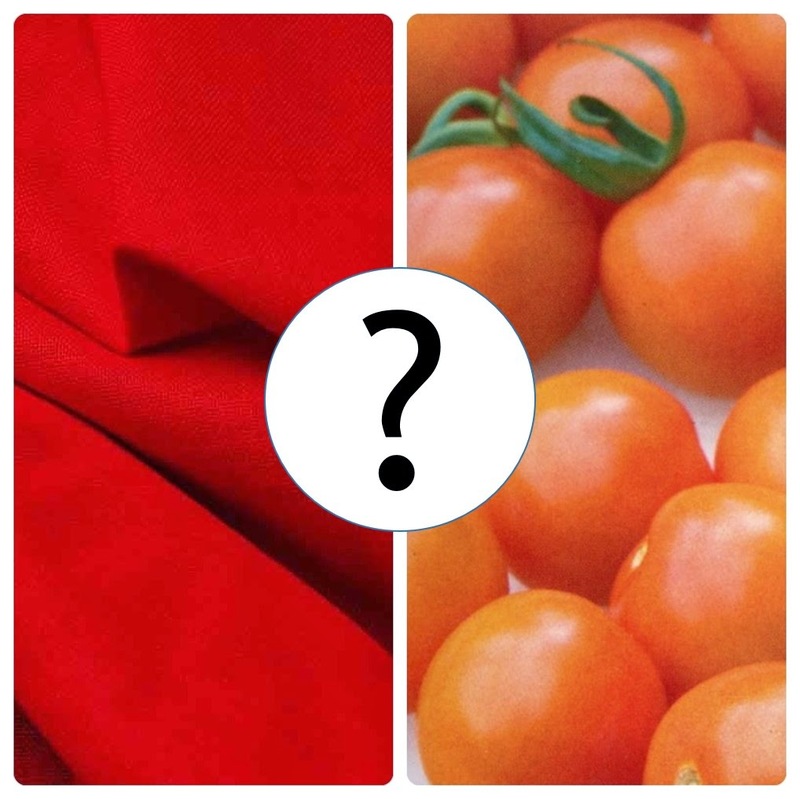 Saturation refers to how vivid a color appears; a bright red has more saturation than a dull red that has gray or black added in. First thing I did was to pull out of my Color Aid pack the true hues of the Artist's Color Wheel; red, red-orange, orange, yellow-orange, yellow, yellow-green, green, blue-green, blue, blue-violet, violet, and red-violet. 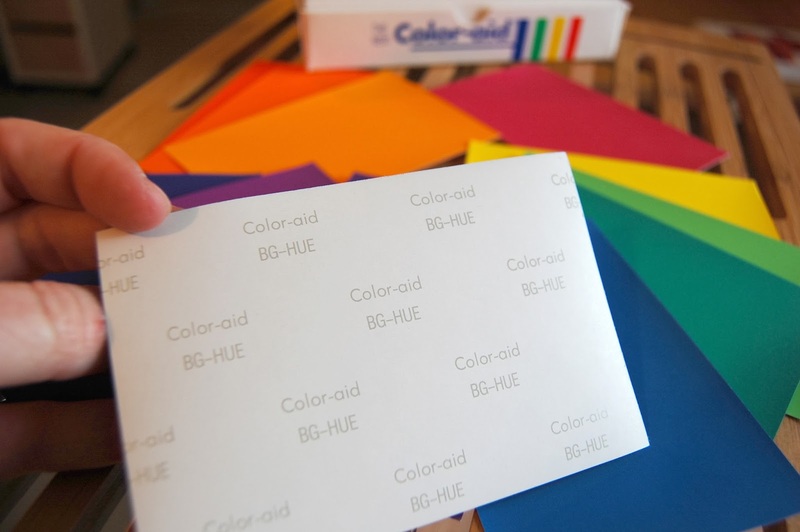 On the back of each color paper is the hue, lightness, and saturation code for the color. You can see the code as "BG - HUE" which means blue-green, true hue, fully saturated. From here I was able to really look at these colors and take them in. I carried them around with me in a sleeve protector when I was searching for fabrics to sew my own fabric Artist's Color Wheel. I played some simple color games with myself, pulling out scraps of fabric from my stash, trying to identify which hue the scraps most resembled. It was interesting to hold the color and think that these are, for reals, the actual hues I was looking at. Red is red, and blue is blue, just like the Color Kittens said. In other words, once you learn what a true hue of red looks like, you're more likely to correctly identify it for what it is - red - and less likely to call it something more arbitrary like "Coke can red" or "cherry red." You are also more likely to notice mixes of colors and name them correctly - like a yellow-green which most people would just call "green." These Color Aid full sets are not cheap - as the inks used to print the calibrated color fast papers are high-quality. But, there are some other sets as well, and I do highly recommend a full set if you are really interested in exploring and learning about Color Theory. Seeing the true colors in your hand while learning how tint, shade, and saturation directly affect colors is invaluable. 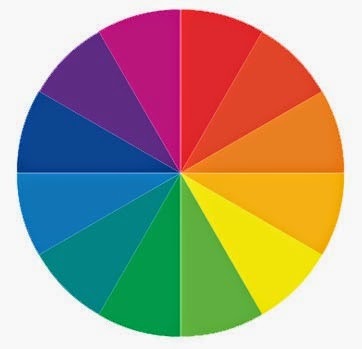 At the very least, you can spend a few bucks on your own copy of a portable Artist's Color Wheel tool like the one here (sold through most art supply stores and some quilting stores, too). 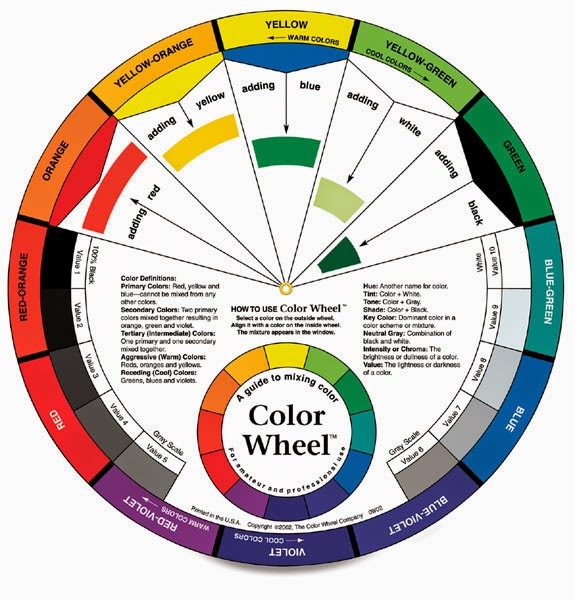 This color wheel displays the true hues on the outer ring, and gives examples of tints and shades along the inside of the wheel. While the colors are not as true as the Color Aid set, it is pretty close for the money. A good tool if you want to explore color a bit, but aren't sure if you want to invest in a Color Aid set just yet. And there you have it. This, my color loving friends, is how you know that green is really green, by using a color tool such as Color Aid or the Artist's Color Wheel. Once you start exploring these aspects of color; true hue, tint, and shade, you'll never lose a color argument again! lol I just painted shelves etc in my sewing room a "Teal" & there was a debate whether or not it was teal or turquoise, after going back & looking on the paint card it actually said caribbian blue ha! it is in the teal family on the card & it's close enough for me so I say teal lol! When my husband & I talk color, we have to use the 8-color box for descriptions -- what he sees & what I see are so different. Even with just 8 from which to choose, we still run into issues. Red & purple are the biggest problem. Are you color studies helping to stoke your creative fires? I'm sorry I haven't been by in a while & am late to see your creative ennui. And again! I missed you at QuiltCon!